Are you a nonprofit professional who is just starting out with content marketing? Or perhaps you’ve been executing for a while now and are wondering how your peers are approaching content marketing? Content Marketing Institute is pleased to announce our first-ever research study on nonprofits. 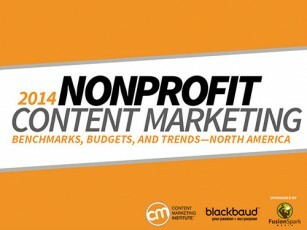 The report, Nonprofit Content Marketing: 2014 Benchmarks, Budgets, and Trends — North America, produced with Blackbaud and sponsored by FusionSpark Media, provides insights on the content marketing habits of 1,714 respondents representing a broad range of nonprofit agencies and organizations. (Note: If you would like to download the PDF, select Save via the SlideShare link.) In this report, we present findings for the overall sample and then look at some of the key differences between those who rated themselves as most effective and those who rated themselves as less effective at content marketing. Here are some of the key findings: Ninety-two percent of nonprofit professionals use content marketing, but only 25 percent have a documented content strategy (click to tweet) Similar to what Content Marketing Institute has observed in our research on both business-to-business (B2B) and business-to-consumer (B2C) companies, many nonprofit organizations lack a documented content strategy to guide their efforts. Those who do have a strategy rate themselves higher in terms of content marketing effectiveness when compared with those who do not have a strategy. Learn the essentials of creating a documented content marketing strategy. 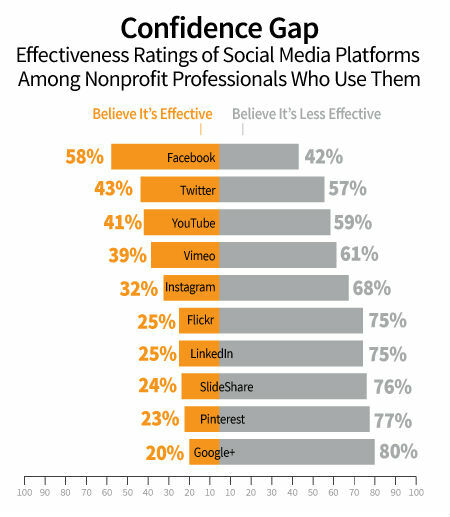 Nonprofit marketers use an average of four social media platforms to distribute content. They choose Facebook most often, with 91 percent using this platform, compared with 89 percent of B2C marketers. That said, they are highly uncertain about the effectiveness of social media — even more so than their peers at for-profit companies are. 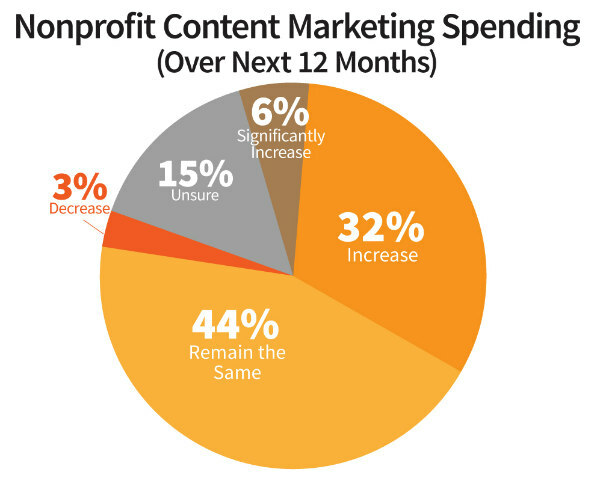 Regardless of company size and effectiveness, nonprofit professionals plan to increase content marketing spending at similar rates. In addition to lack of time (69 percent), nonprofit professionals are challenged with a lack of budget (67 percent), producing engaging content (48 percent), and lack of knowledge and training (45 percent). 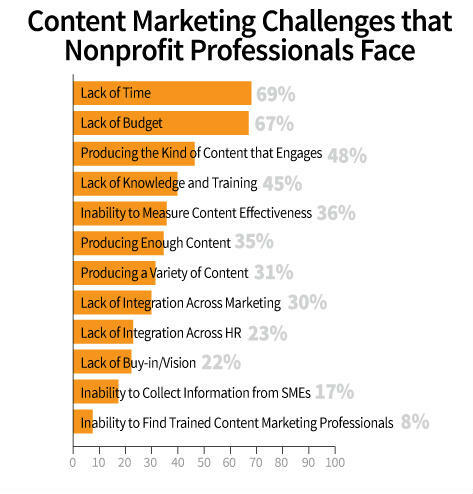 However, the most effective nonprofit professionals are far less challenged than their least effective peers are with producing engaging content (37 percent vs. 62 percent) and lack of knowledge/training (22 percent vs. 71 percent). The research also shows that only 26 percent of nonprofit professionals consider themselves effective at content marketing. This is a fairly new discipline among nonprofit communicators, and it will be interesting to see if their confidence rises next year as they gain more experience with content marketing. 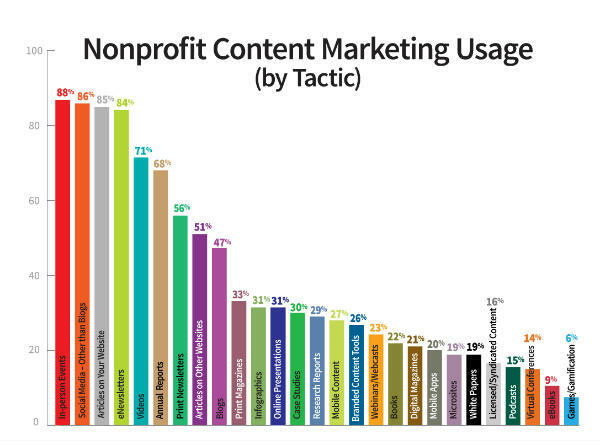 Want to see more insights about nonprofit content marketers? View Blackbaud’s infographic that looks at five key questions the research answers — with tips from experts. While it is useful to see where we are, it’s even more exciting to figure out where we are going. Over the coming weeks and months, we’ll share more breakouts of how nonprofits are using content marketing, as well as ideas on how you can get to the next level in your content marketing efforts. Subscribe to our daily or weekly newsletter to stay informed. And, if you work for a nonprofit, let us know your experiences with content marketing. What are some programs you think work well? And where would you like to get help?